Welcome back to another week of Fantasy basketball action. Yours truly has returned (stealing back the Troll from your Editor). This year’s NBA All-Star Weekend is in the bag, and the league is back to its regular scheduled programming. This week, the trade deadline has arrived (a clueless Nick Young didn’t even know when it was) – which included deals like a Jeff Green (Grizzlies) and Lance Stephenson (Clippers) swap, and the desperate dumping of Markieff Morris (Suns) to Washington. Patty Mills, PG, San Antonio Spurs (ESPN: 17 per cent, CBS: 14 per cent): If you need a quick fix point guard, Mills might just do the trick. He’s still widely available for grabs, and his ability to contribute points and assists off the bench give him some Fantasy value. Coach Gregg Popovich may even look to rest starter Tony Parker as we head closer towards the playoffs, giving Mills looks to produce some deep roster stats. 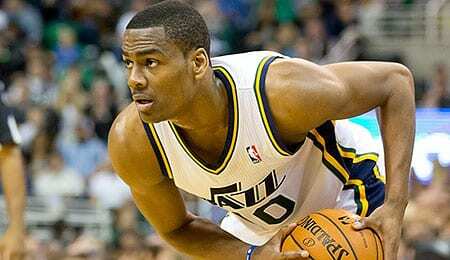 Alec Burks, SG, Utah Jazz (ESPN: 13.6 per cent, CBS: 39 per cent): Burks is making progress from a foot injury, and may be ready for action soon. Though a return date isn’t pinpointed, his 40 per cent ownership rate on CBS reflects that he is valued in Fantasy leagues. If you could afford to, and could use a scorer, go stash Burks and see if he surprises you upon his return — after all, let’s not forget what a stud he was at the University of Colorado (see video below). Brandan Wright, PF, Memphis Grizzlies (ESPN: 9.5 per cent; CBS: 28 per cent): Wright might just have to re-“Brand” the four position in Memphis, especially with Jeff Green gone, starter Marc Gasol (foot) out for the rest of the season and Zach Randolph being shifted over to the five spot. Though Wright battles recently acquired Chris Andersen and Ryan Hollins for the spot, he appears to have the most upside of the three. Wright will be limited and slowly eased back into regular minutes given that he’s just coming back from a knee injury. If you believe in opportunity, here’s your chance to invest in one. Mirza Teletovic, PF, Phoenix Suns (ESPN: 9.5 per cent, CBS: 29 per cent): Mirza has been a devoted scorer in Phoenix — leading the way with a team-high 25 points to go along with eight rebounds and a couple of assists Friday against the Rockets. This performance may have given him the edge over Jon Leuer as the new starting power forward in Phoenix with Markieff Morris now out of the picture. Cody Zeller, Charlotte Hornets (ESPN: 16.6 per cent, CBS: 40 per cent): Even with Al Jefferson returning Friday, Zeller was able to put up a season-high 23 points with nine rebounds and two assists in a win over the Bucks. It’s unclear if Zeller will keep this up as Big Al eases back towards a full complement of minutes – but if you need some points and boards, then Zeller is a good pickup.